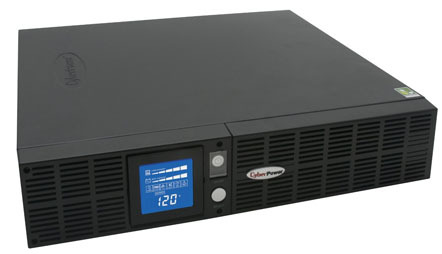 The CyberPower Smart App Intelligent LCD OR2200PFCRT2U uninterruptible power supply (UPS) with pure sine wave safeguards networking hardware, networked-based devices, small office servers, workstations and telecom equipment that use conventional and Active Power Factor Correction (PFC) power supplies. Its automatic voltage regulation (AVR) topology delivers clean and consistent AC power, protecting connected equipment and preventing costly business interruptions. The OR2200PFCRT2U unit has a capacity of 2000VA/1320 Watts, eight NEMA 5-20R receptacles and four maintenance-free, user-replaceable 12V/9Ah batteries. The rotatable front LCD panel displays all major UPS vitals for ease of use. This unit offers connectivity via one HID USB and one DB9 serial port. Protection for phone/network (RJ11/RJ45) and cable/coax (RG-6) is included. EMI/RFI filters increase the immunity of the load to noise disturbances. This UPS incorporates microprocessor-based digital control and includes PowerPanel Business Edition providing the user unsurpassed flexibility and agent/client control of up to 25 clients. Solves the critical compatibility issues of non-sine wave UPS products working with systems using Active PFC power supplies (ENERGY STAR 5.0). Ensures equipment utilizing Active PFC power suqpplies do not unexpectedly shutdown or experience harmful stress when switching from AC power to UPS battery power.